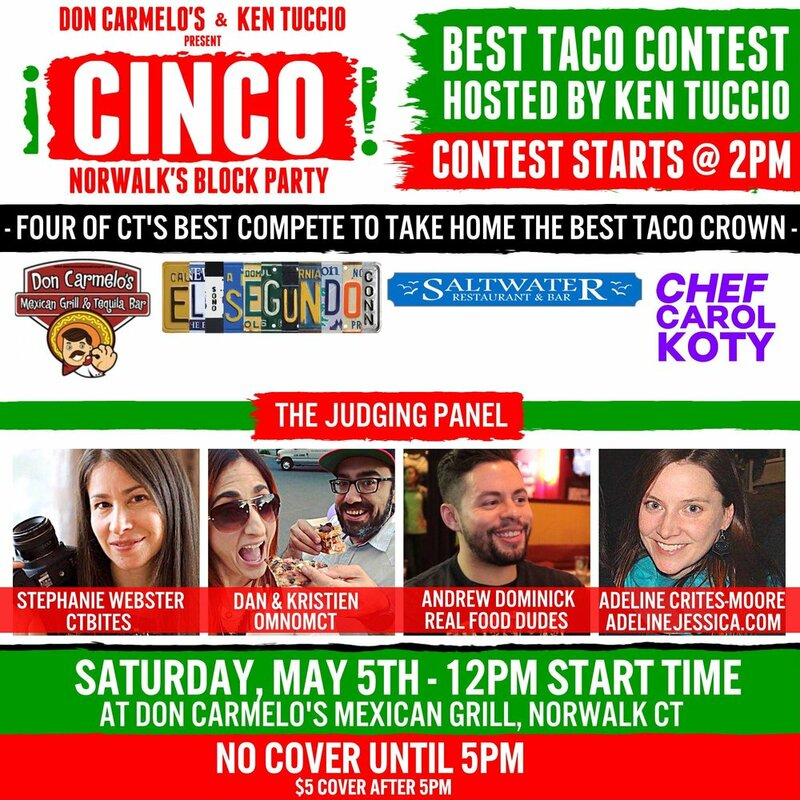 Ken Tuccio is teaming up with Don Carmelo’s Mexican Grill in Norwalk CT for CINCO, an all day block party event, going down on Saturday May 5th at Don Carmelo’s. This event kicks off at 12pm and goes all day and it is absolutely loaded with events and activities. This block party is also going to feature two separate culinary competitions featuring some of Fairfield County’s best restaurants. At 2pm there will be a Best Taco Contest, during which four restaurants will battle to see who can create the best taco. The competing restaurants are Don Carmelo’s, El Segundo, Saltwater Restaurant and Chef Carol Koty, who has appeared on several Food Network programs. A panel of some of Connecticut’s best known food experts will be doing the judging (including CTbites)! At 5pm it’s margarita time, when Don Carmelo’s, The Blind Rhino, Washington Prime and The Spread battle it out in a Best Margarita Contest! The judging panel consists of Teresa DuFour from WTNH’s CT Style, Esther Katro from Fox 61, Lora and Bev from Unlocking Connecticut and James Gribbon from CTBites! CINCO will feature four live bands, kicking off when the party starts at noon. The bands are Elle Sera, Mind The Gap, A Strange Utopia and Reggae Culture! The Kentucky Derby also happens on Cinco De Mayo this year, so to make sure you can enjoy the horses, Ken Tuccio will transform the block party into a one hour Kentucky Derby Pop-Up Party! From 6pm – 7pm they’re going to roll out a big screen projector so you can watch the race and there will be FREE MINT JULEPS for the crowd during the party. You’ll also have a chance to pick the winning horse and take home some prizes! On top of all of that, Ken Tuccio has teamed up with No Worries Brewing Company in Hamden CT to brew EVENFLOW MEXICAN LAGER, which will make its first appearance on tap anywhere during CINCO at Don Carmelo’s. The CINCO block party is the only place in the state you can get this beer, it won’t be available anywhere else! There will also be a Corona Beer Bus on location, giveaways all day long and a ton of other surprises! The party kicks off at 12pm and there is no cover until 5pm. It goes down at Don Carmelo’s Mexican Grill, located at 7 Winfield St in Norwalk! It’s far and away the biggest Cinco De Mayo event in the state this year, so come join the party on Saturday May 5th!